SARATOGA GLASS WORKS, AKA: MT.PLEASANT, GRANGER GLASS WORKS & MOUNTAIN GLASS WORKS WERE AN IMPORTANT PART OF SARATOGA AREA FROM ABOUT 1845 ~ 1865 AREA. THERE IS VERY LITTLE THERE NOW. is situated in the valley a few rods east of Broadway, between Lake avenue and Caroline street, and directly at the head of Spring avenue, and is reached from Broadway by taking Lake avenue or Caroline street to the second block. It is one of the best of the far-famed springs of Saratoga. The shaft has been re-excavated ten feet deeper to the rock: the spring re-tubed, the course of the brook (which flowed through the grounds) changed, well-arranged walks laid out, and a tasteful pavilion built over the fountain. The shaft of the spring having been carried out through the hard pan to the rock below has greatly improved the water. Its minerals have been nearly doubled in strength and increased in number, and the fountain now stands second to none for medicinal and commercial purposes in this justly-celebrated mineral valley. This deep tubing will therefore secure a uniformity in the strength and quality of the water which cannot be obtained in springs which are tubed near the surface of the ground. John Clarke was a soda fountain owner in New York City. He saw the potential of the area's pure water and purchased land with partner Thomas Lynch in 1823. 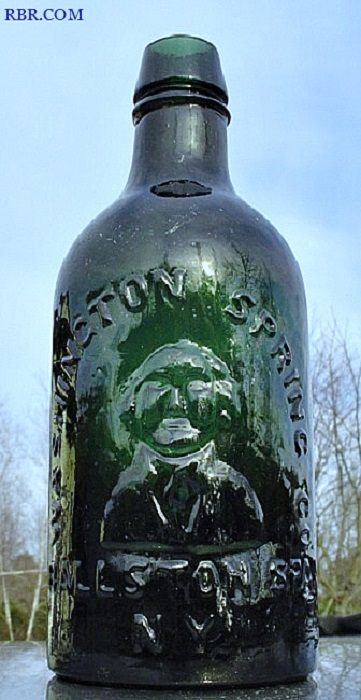 In 1825 both men started bottling water. Saratoga Springs was the home to 122 natural springs and renowned for the therapeutic mineral water. The Iroquois Indians called the High Rock Spring the " Medicine Springs of the Great Spirit". The first bottles produced were from the Mt. Vernon Glass Works. 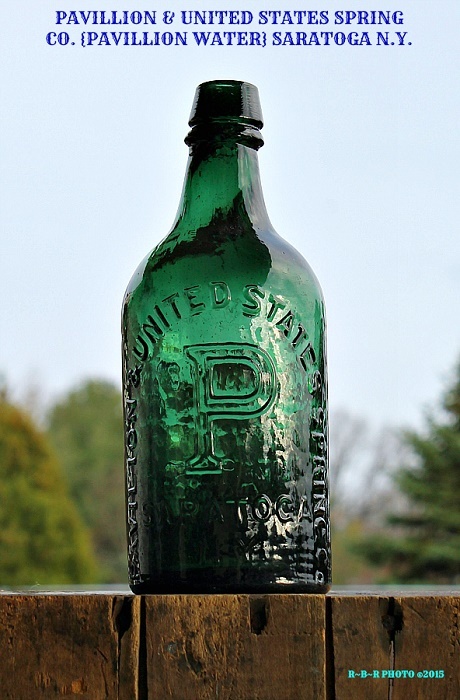 The bottles were embossed LYNCH & CLARKE until 1833. This was the year Thomas Lynch would die. Then the Bottles were embossed John Clarke. John Clarke would marry Widow Eliza White who purchased the High Rock Springs. Together they form the Company Clarke & White and bottled their Saratoga mineral water. Clarke successfully marketed his bottled water across America and Europe. 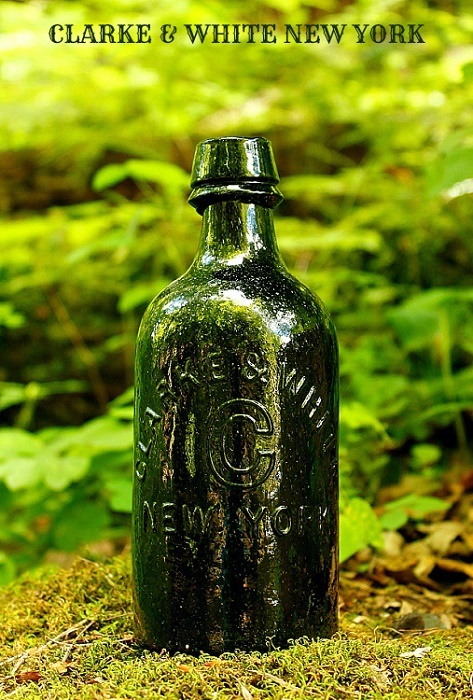 The Clarke & White mineral water bottles are one of the most common do to their success. (Disagree with this) John Clarke would die in 1856. A few years after his death a William B. White bought the property from his heirs and remained sole owner until his death. Mrs. Sheehan Bouty how was William's sister bought the property from William's heirs. Now she would become the sole owner. She would sell one half of her interest of the company to Chauncey Kilmer and a corporation was formed now called The Congress And Empire Spring Company. Bottles embossed with the C come from the Congress Springs and bottles embossed with an E come from the Empire Springs. At some point the Hotchkiss family became the principal shareholder and by 1884 the company would split forming two companies. One was called the Congress spring Company and the other called Empire Spring Company. References: Saratoga's by Bernard C. Puckhaber 1976. Sylvester's History of Saratoga County 1866 and 1878. Frank & Frank Jr. Bottle Collection. In the 1866 Atlas of Saratoga County Sylvester wrote the following: ?About the year 1850 a glass factory was started on the mountains in the northwest part of the town (Greenfield) a little village of about one hundred inhabitants sprung around it. It was named Mount Pleasant. Some years ago the factory was removed to Saratoga Springs, and the village followed it to its new location.? Not a very fitting obituary for so important a place, especially to bottle collectors with a yen for a bit of history connected with an old hand made bottle! First of all lets straighten out the various names that have been associated with this glass house. Most glass works are easily identified with a single name, not so Mt. Pleasant. Bernie Puckhaber, in his extensive research on Saratoga County mineral waters, has listed the following names that have been associated with the facility: (1) Saratoga Glass Works (2) Saratoga Mountain Glass Works (3) Mt. Pleasant Glass Works (4) Granger Glass Works and/or (5) Mountain Glass Works. The owner called this plant the Saratoga Glass Works so I suppose we should finally settle on this as the official name. Along about 1810 a petition was approved by the New York State Legislature and the Mt. Vernon Glass Co. came into being. They made a large number of beautiful flasks. By about 1823, John Clarke and Tom Lynch were beginning to look for a source of bottles for their mineral water. At this time a Charles Granger was the superintendent of the Mt. Vernon Glass Works, a few miles west of Utica, N.Y. He was given the contract to produce the ?Lynch and Clarke? bottles in spite of the long distance between Mt. Vernon and the mineral springs around Saratoga. Gradually the Granger family became the dominate forces in the Mt. Vernon works and an Oscar Granger became plant superintendent. 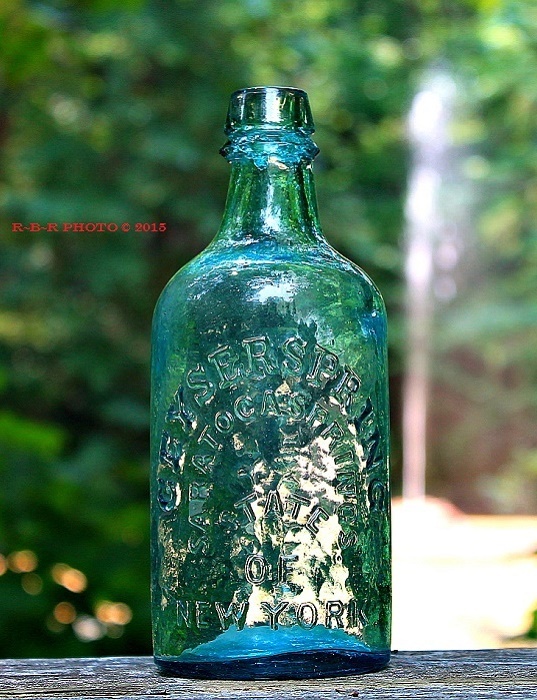 By 1843, the Saratoga mineral water business was in full swing and the demand for these bottles was taking the capacity of the Mt. Vernon plant. In addition to this, the supply of wood needed to keep the furnaces going was beginning to fail. It was about this time that the Grangers decided that in order to remain in business they should build a modern glass factory, near to the source of their main outlet and having an ?endless? wood supply and a supply of pure sand. Oscar Granger was given the responsibility of finding a suitable location. It seems fitting to state that the Mt. Vernon Glass works continued to produce glass until about 1850. Mt. Pleasant. James was a partner until 1850. Before 1850 Oscar Granger?s nephew Henry arrived from Mt. Vernon to help with the business. The other Grangers, Charles and Gideon remained behind to phase out the old Mt. Vernon operation. The establishment of this new factory involved three undertakings: (1) establishing the new village, (2) improvement of roads and transportation and (3) planning and construction of the glass factory itself. The map of Mt. Pleasant shows the layout of the village; the other maps show the location of the works in relation to the surrounding country. Transportation and accessibility was a real problem. In those days going up the mountain was generally through Greenfield Center to Porter Corners and then west to Mt. Pleasant. Most of this was a toll road so a fee was charged for each passage. Much of the time in the winter one would be snowed in the mountains - it was a hard life! To expedite the movement of wagon loads of bottles down the mountain a dug way was devised by Mr. Granger. Horses or oxen brought the wagons to a launching platform at the top of a long right angled cut in the side of the mountain. Here the teams would be unhitched and the loaded wagons would be let down with the aid of a series of ropes and a windless into Middle Grove (then called Jamesville). From here the teams were again used to convey the bottles to their destination. Some parts of this old dugway can still be seen. Some do not believe that such a dugway ever existed for this purpose. shown on a county map. In 1948 Mr. Lowe wrote, ?it is considerably grown up now, but I have been over it in a wagon about fifty-five years ago.? We will probably never know for sure whether Oscar Granger used it or not. After having delivered the load of bottles in Saratoga Springs, the teamsters would pick up a load of lime at a quarry in Rowlands Hollow or a load of sand at Chatfield Corners on their return trip. The factory itself was a large round building, perhaps fifty to seventy five feet in diameter. It had a large high smoke stack in the center which picked up the smoke from the large conical furnace. Around this furnace were six fireholes from which the glass blowers could gather the glass or ?metal? to blow the bottles. The 1850 census reveals that there were five glass blowers living at Mt. Pleasant and a total population of 200 of which 40 worked in the glass factory. it also reported that 7,200,000 bottles were produced annually. This continued for more than twenty years when in 1865 it was sold to the Congress and Empire Glass Works in Congressville, a suburb of Saratoga Springs. Tradition has it that all the houses from Mt. Pleasant were moved to Congressville along with the glass factory equipment. Railroad, and half pint Cornucopia flasks. 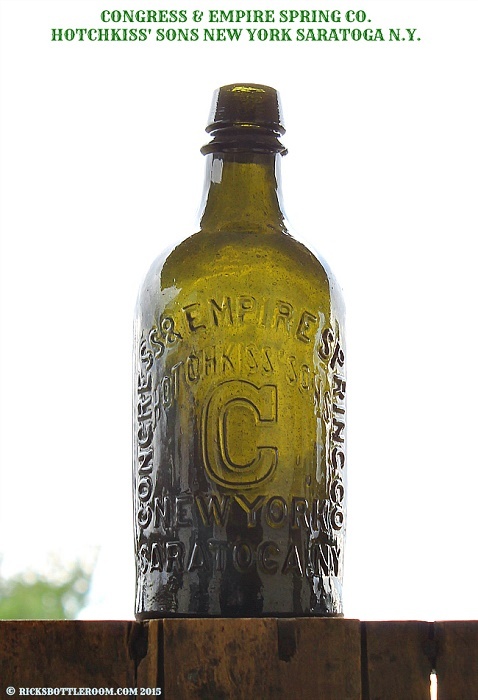 Other bottles blown were: inks, Dr. Townsend Sarsaparilla, E. Roome/Troy/New York, other cylinder bottles without embossing, a limited number of chestnuts and porters, wine bottles, peppersauce, varnish, and B. Fosgate?s Anodyne Cordial (in which the N?s are backwards). As was usual at all glass works, the blowers would blow ?occasional pieces? and the men at Saratoga were no different! It is reported that these usually were rolling pins, pitchers, match holders, lily pad design plates and probably many other items. It has recently been realized that threadless insulators were also made at this works. Many parts and pieces of which have been dug by the author and others. A recent article in Antique Bottle and Glass Collector by Ray Klingensmith tells this story so it will not be repeated here. An attempt to list all of the colors, tints, shades, hues etc. of old glass bottles would be nearly impossible. ?Mountain Glass,? as pieces from this works are called, can be described as very dark, nearly black olive green or olive amber. Some chards of glass found there also include blue-green, dark green, dark amber and aqua. The glass is generally dark, bubbly and greasy. It is recognized that great caution must be used when trying to identify a certain piece of glass with a specific glass house. Recent techniques using mass spectrometer and other analytical methods can be of great assistance to the student of glass. Most of us can only go by known dates when companies were in business, colors most likely used, mold marks and other such unscientific facts. 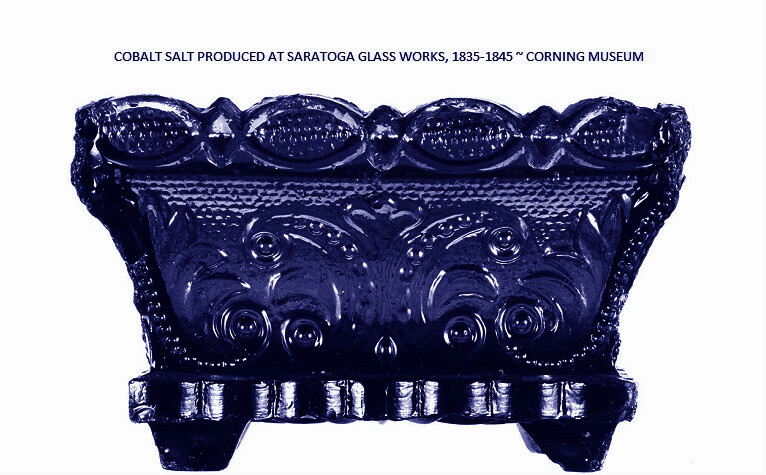 The known base marks from the Saratoga Glass Works include the numbers 1 through 5 and the letter ?B.? Bases both with and without pontil scars have been dug there. One has to be very careful in attributing a particular bottle to a certain glass house just because a chard was found there. On a recent dig at the Saratoga site, Bob Joki dug a chard from a Lynch and Clarke bottle. These bottles were blown at Mt. Vernon and the company went out of business around 1833 - the Saratoga Glass Works was built in 1844 so a Lynch & Clarke could not have been blown there. What probably did happen, since both plants were owned by the Grangers, was that some cullet, or broken pieces of glass, were taken from Mt. Vernon to Saratoga for making glass. We know that molds were moved from plant to plant, why not cullet? What a great experience it is to dig on these old sites. I can?t wait for spring so I can go back! Puckhaber, we drove up the road past Lake Desolation and up to the top of the mountain, where we pulled over and stopped. The area is completely grown up and there is very little to indicate the great activity which once flourished here. If one searches the woods, the foundations of some of the homes and other buildings can be found. The roads have been changed a bit making it harder to visualize how it used to be. The recent photos will illustrate how it looks now. To the careful observer the bits of glass that are everywhere is a dead giveaway of what went before! 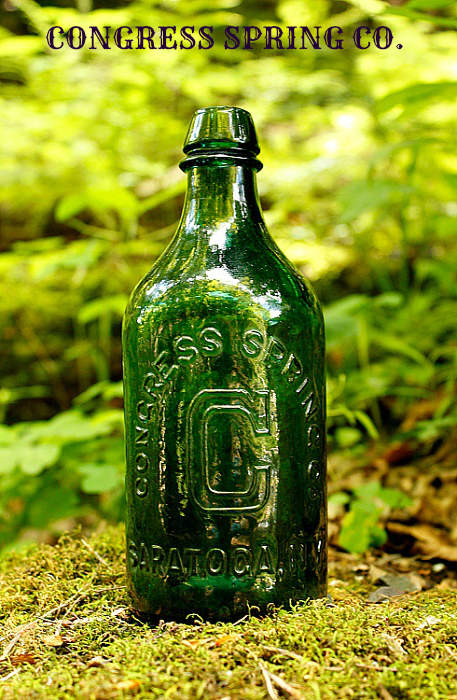 Gone is Saratoga Glass Works, but it is far from forgotten by a few diehard bottle and history buffs. At the opening of the National Bottle Museum in Ballston Spa in June 1984, the Saratoga Bottle Collectors Society sponsored a Saratoga Glass Works exhibit. In addition to bottles and other pieces blown there, pictures of the Grangers, glass making tools, the main item was a large model of the old glass works made by Gerry Strubel. It was recently learned that a grant of $750 by the Gannett Newspaper was made available to put the model on a mobil basis so that it can be taken to area schools as a teaching aid. We will not let the old Saratoga Glass Works be forgotten! This spring is a most wonderful fountain of mineral water. It was discovered in 1870, and is situated about one mile and a quarter southwest of the village of Saratoga Springs, in the midst of the beautiful region now known as "Geyser Lake and Park." The spring-house is a building which was formerly occupied for manufacturing purposes; but has, since the spring was discovered, been fitted up for the reception of visitors. As you enter the building, directly in front is this marvelous spouting spring, sending forth a powerful stream of water to the very top of the room, which, in descending to its surrounding basin, sprays into a thousand crystal streams, forming a beautiful, overflowing fountain charming to behold. In the centre of the room is the artistical basin into which the spray descends. It is about six feet square, and from the bottom rises an iron pipe. From this pipe leaps, in fantastic dance, the creamy water of the spring. To allow it full play there is an opening in the ceiling, and here it rises and falls, day and night, continually. A large business is here carried on in bottling this valuable water. Mt. Pleasant Glass Works – Saratoga, N.Y. - Some business matters eastward, to the place above mentioned, we propose to give a description of it, for the benefit of our readers. Mt. 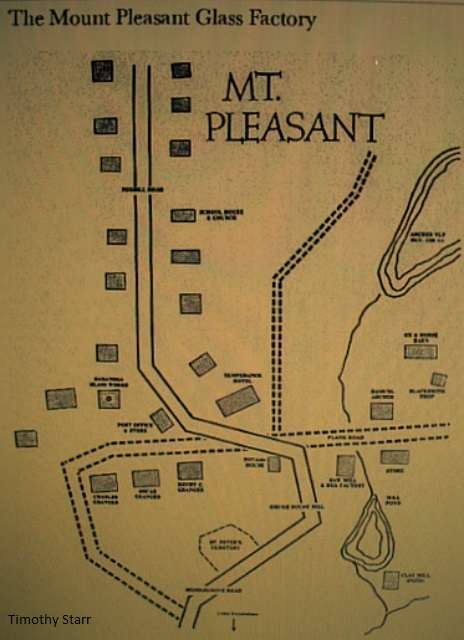 Pleasant is situated in Saratoga co. about thirteen miles northwest of Saratoga Springs. It is at the summit of one of the Kayaderosseras mountains and is quite a pleasant little place, though it has no particular importance save what is given it by the Glass Works” located there. We might remark here in passing, that in the ascent of this mountain, one of the finest views in the State, can be obtained. As you cast your eyes eastward, you can see the “Green Mountains” stretching along to the northward, while a beautiful perspective of hill and dale, plain and valley, cultivated fields and patches of woodland, fill up the middle ground; the village of Saratoga lies nestled as it were among the hills, its numerous church spires glittering in the sunlight; the water of the Saratoga lake, flashes and sparkles like a silver mirror wrought up to its highest degree of polish, the whole forming one of the most beautiful natural panoramas on which we ever gazed. There is nothing on earth which fills us with such complete delight as those pictures of beauty drawn by the hand of nature, especially when that of art has been used in joining and blending the several parts, so that the combination exactly meets our idea of the perfection of both. Such a scene is one on which our eye could ever untiringly rest. But to retire to our subject - “The Glass Works” to which we have referred, are owned by Mr. Gideon R. Granger, who formerly resided in Horton Settlement in this town and a nephew of his. They employ in and about the “Works” something near forty hands. The manufactory is in operation during nine months of the year, more or less according to circumstances. 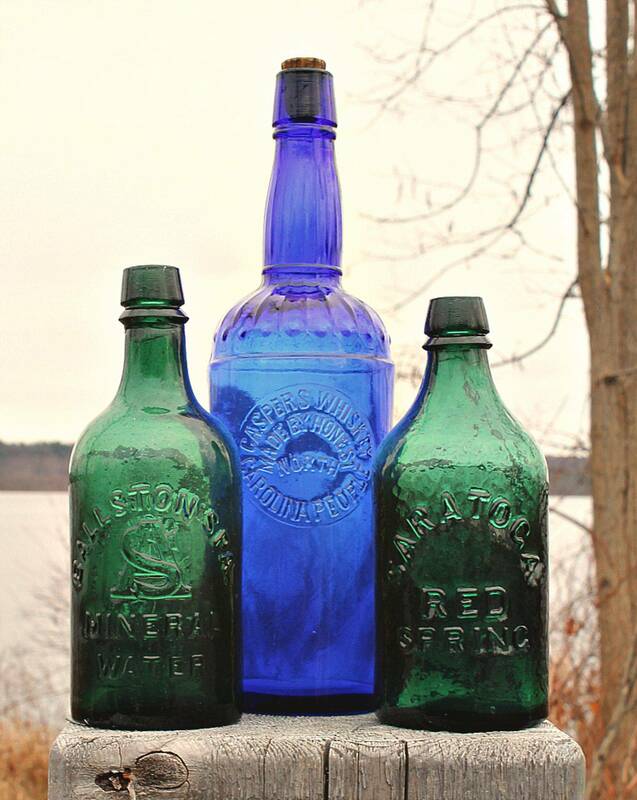 The glass is blown into pint and quart bottles, all of which is purchased by one firm in Saratoga, and used in bottling up the celebrated medicinal waters for which that place is so famous. As some of our readers may not be aware the process by which glass is made, and the manner of converting it into bottles as aforesaid, we will here give a brief history of the method pursued. 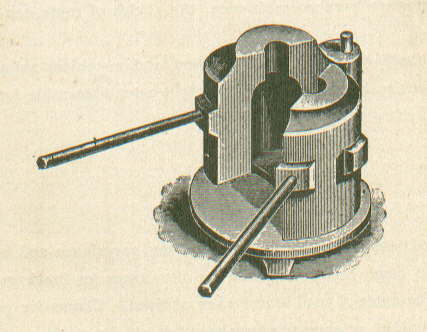 The sand, soda, lime &c., which forms the compound out of which it is made, pre-sifted and thoroughly mixed in the proper proportions, and then conveyed to ovens where it is heated for several hours by a fire kindled beneath, being frequently turned, in the mean time, by long iron shovels which are prepared for that purpose. It is then conveyed into the “pots”, which are placed in the furnace, to undergo the melting process. These pots are made out of a sort of clay that is imported from Germany, and requires much skill and experience in preparing them for the contemplated use. After the composition is emptied into these vessels, the whole is submitted to a heat of such intenseness that “Nebuchadnezzar’s fiery furnace” would give but an imperfect ides of it. In order to show how this amount of heat is obtained, we will offer a word of explanation as to the preparation of the fuel. After being cut and drawn to the works, it is split up fine like oven wood, and then “kiln dried.” That is about a cord of it is placed in a huge oven, (a fire being kept burning below it) and kept there until the wood will burn almost as readily as powder. Six of these ovens are constantly employed in thus fitting fuel for the furnace. After it is thus dried and properly placed, the melting operation proceeds in this way. There are two openings in the furnace for the insertion of wood. They are about seventy feet apart. A man takes a single stick of this wood (occasionally two) and walks to the opening and inserts it; he then turns about and walks to the other opening, picking up another stick as he goes and shoves that in, and thus continues to walk backwards and forward for the spate of six hours, when another takes his place. We made an estimate of the distance traveled over by this man during his “trick” and found it exceeds twelve miles. The distance thus passed over in twenty-four hours would, of course, be forty miles. Now let it be remembered, that this furnace is kept burning uninterruptedly night and day, Sundays not excepted, for at least 250 days, and we have the distance of 12,000 miles walked over in supplying the furnace with fuel, or nearly half the circum- ference of the globe. The reason why the wood is put in, this sparing and regular manner is, in order to get an equal as well as an intense heat. The furnace when thus lighting up, forms a brilliant and magnificent light. When the composition is sufficiently melted, which takes from ten to twelve hours, next comes the “blowing” operation. To do this each “blower” is furnished with an iron tube, between three and four feet long and about three-fourths of an inch in diameter. He then inserts one end of this into the melted glass which is about the consistency of thick buck wheat batter though of a different texture, and takes what he judges will form a bottle. He then commences rolling the tube in his fingers, and after a little roll of the composition on a smooth stone that is before him until a rough draft of a bottle is made to appear. He then places the glass bottle connected with the tube into a cast iron mold that is fixed in the floor on which he stands and which mold is of the exact shape of the bottle to be made and he puts it in the mold drops his foot and puts his mouth to the top of the “tube” and blows vigorously. He then lifts his foot, the mold opens and the bottle is made except the nozzle. He then thrusts the bottle back into the furnace and heats it slightly, withdraws it, and by a dexterous jerk, disconnects the bottle from the “tube.” He next takes a small portion of the glass and forms a ring around the top of the neck, and before it hardens places it in a steel die, and turning it round a few times rapidly, the crease and protuberances are which finishes the bottle. It is then taken and placed in an oven where it is properly tempered, then it is packed away with its fellows, and sent to its destnation. We might write much more that would be interesting on the subject, but as we have already exceeded all reasonable limits, we will here close.